The Wall Street Journal dubbed musician Salme Dahlstrom a “music licensing queen” when, like Moby before her, she managed to license every track from her 2008 album The Acid Cowgirl Audio Trade to various corporations and television programs. At the time, Dahlstrom, who produces, performs, edits, and mixes all of her tracks herself, was not only just getting noticed, she was just getting started. “C’mon Y’All,” one of catchiest numbers on an album of catchy numbers, climbed Billboard’s Dance Chart and eventually received prominent placements in major ad campaigns for CoverGirl, Suave, and Kellogg’s that ran on primetime network television for months. While managing what inevitably became a highly successful licensing business, Dahlstrom continued to do the work that got her there, and will now release “Pop Propaganda Volume 2: Retro Funk Soul Junction” on September 16th, 2014. The new six-song collection is preceded by the single “Pop Ur Heart Out” on August 5th, 2014, accompanied by a trio of remixes of the track by SpekrFreks, DJ Phunkae, and Quadrat Beat on August 26th, 2014. About “Pop Ur Heart Out,” Dahlstrom says, “I felt like bringing some soul and poetry to the party. I used organic instruments - piano and acoustic guitar - and mixed them with glitch effects and Kaoss Pad to give it an electronic edge. It's one of my new favorites!” +++ Bio: The Wall Street Journal dubbed musician Salme Dahlstrom a “savvy singer” and “music licensing queen” when, like Moby before her, she managed to license every track from her 2008 album "The Acid Cowgirl Audio Trade" to various corporations and television programs. At the time, Dahlstrom was not only just getting noticed, she was just getting started. “C’mon Y’All,” one of catchiest numbers on an album of catchy numbers climbed Billboard’s Dance Chart and eventually received prominent placements in major ad campaigns for CoverGirl, Suave, and Kellogg’s that ran on primetime network television for months. Trust us, you know this song! While managing what inevitably became a highly successful licensing business, Dahlstrom continued to do the work that got her there, releasing the first of a three-EP set as a follow-up to the various singles and remixes that came from and were inspired by "The Acid Cowgirl Audio Trade." “Pop Propaganda Volume 1: Bang,” released in June, 2013, will now be followed-up by “Pop Propaganda Volume 2: Retro Funk Soul Junction” on September 16th, 2014. The new six-song collection will be preceded by the single “Pop Ur Heart Out” on August 5th, 2014, accompanied by a trio of remixes of the track by SpekrFreks, DJ Phunkae, and Quadrat Beat on August 26th, 2014. “I played all the instruments, I programmed, produced, edited and mixed it all myself,” Dahlstrom says of her creative process. “Except for a couple of guest vocalists, I did that too – the singing, that is.” Dahlstrom’s work ethic stems from a childhood spent studying classical music in her native Swedish countryside since the age of four (she came to the US in 1999), followed by teen years writing songs and performing with local bands. Dahlstrom’s professional career began soon after with an EMI publishing deal (foreshadowing her success in licensing) and countless hours in the studio where she learned to produce. While “Pop Propaganda Volume 1” saw Dahlstrom exploring electro beats and allowed her to bend her style to the popular EDM sound, “Pop Propaganda Volume 2” brings her back to the break beats that she loves the most. “I am glad to be back in break beat territory,” she explains. “I needed a vacation from it, to gain some perspective, and now I feel like I have something new to bring to the genre.” She continues, saying, “‘Pop Propaganda Volume 2’ calls back to my love of the British ‘Big Beat’ movement. Big beats, funky guitars, and a tongue-in-cheek attitude. There’s a soul influence, too.” Regarding that last bit, Dahlstrom reminds us she lives in New Jersey when she humbly jokes, “My soulfulness is probably on the level of Jon Bon Jovi’s, but when you feel it, you gotta go with it, right?” Though Dahlstrom is an artist who lets her sense of humor show through in a genre sometimes perceived as cold, the lyrics on her new set of tunes definitely come from an authentic place, despite her comical questioning of her degree of soul “I wanted to write from a more poetic place,” she explains. “These songs are attempts to tell the same old story of love from a fresh angle. 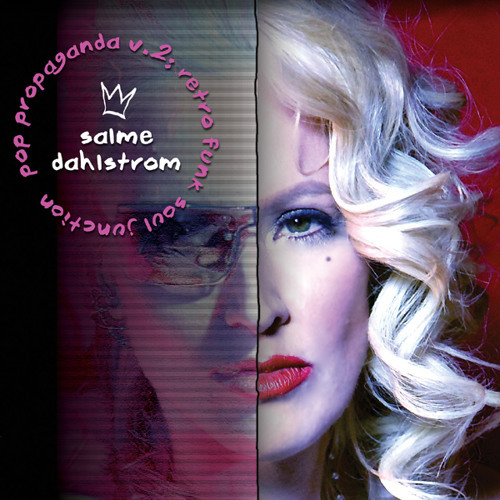 I picked ‘Pop Ur Heart Out’ as the first single because it’s vastly different from anything I’ve done before.” “Pop Propaganda Volume 2: Retro Funk Soul Junction” by Salme Dahlstrom is scheduled for release on September 16th, 2014 via Kontainer Music. The first single “Pop Ur Heart Out” arrives on August 5th, 2014, accompanied by a trio of remixes of the track by SpekrFreks, DJ Phunkae, and Quadrat Beat on August 26th, 2014.